Involvement of Dystroglycan in Epithelial-Mesenchymal Transition during Chick Gastrulation. Nakaya Y, Sukowati EW, Alev C, Nakazawa F, Sheng G.
A small genomic region containing several Loci required for gastrulation in Drosophila. Mathew SJ, Kerridge S, Leptin M.
Figure 6. 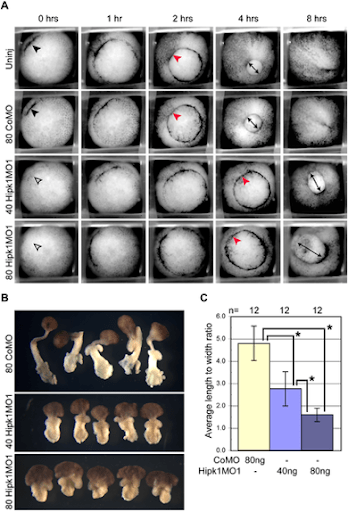 Hipk1 is required for gastrulation and convergent extension movements. 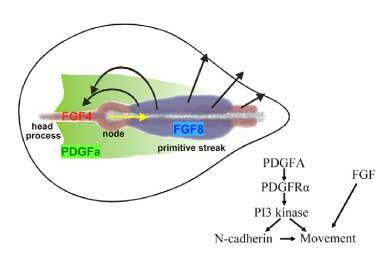 Morpholino-mediated knock-down of Hipk1 perturbs initiation and progression of gastrulation. (A) Hipk1 morphant embryos exhibit delay of dorsal blastopore lip formation and do not close the blastopore compared to controls (see text). Frames from movies of gastrulating embryos in parallel are presented, from embryos that were either uninjected (Uninj) or injected in the DMZ at the 4-cell stage with 80 ng of CoMo, 40 ng of Hipk1MO1, or 80 ng of Hipk1MO1 as labeled. Elapsed time after appearance of the dorsal lip (black arrowhead) in controls (0 hrs) is indicated. See text for details. (B and C) Keller explant sandwiches from Hipk1 morphant embryos exhibit dose-dependent failure of convergent extension movements compared to controls. DMZ explants were cultured as sandwiches to Stage 19 and average LWR determined. LWR was significantly decreased in Hipk1 morphants compared to controls, and this was dose-dependent (*Pr(T>t) = 0.00001 using 2-sample t test with equal variances).